the capital of Lebanon, is a port and financial and commercial center on a promontory framed by the Lebanon Mountains. Originally an ancient Phoenician settlement, Beirut was ruled by Romans and Arabs and was an object of struggle during the Crusades. The Saracens captured the city in 1291 and it remained part of the Ottoman Empire until recapture by the French in 1918. 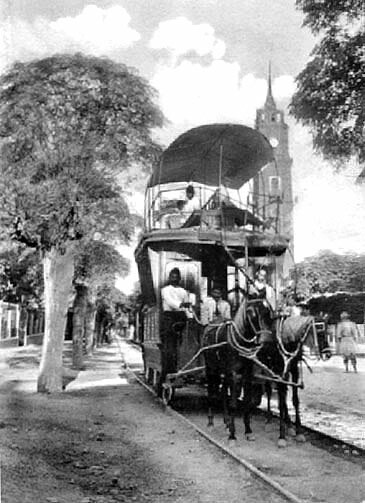 The tram system opened on April 19, 1908, and by 1931 there were 12 km of track and 75 cars. The postcard shows one of the early models. The last tram ran in September, 1965.
founded by the Phoenicians in the 7th Century B.C., is a commercial city and seaport in northwest Lebanon. It was later occupied by Romans, Muslims, Crusaders and Arabs, and by the British in 1918 and the French in 1941. The postcard shows a tram on the main line from Tripoli to the port of El-Mina. There was also a short local line in Tripoli. 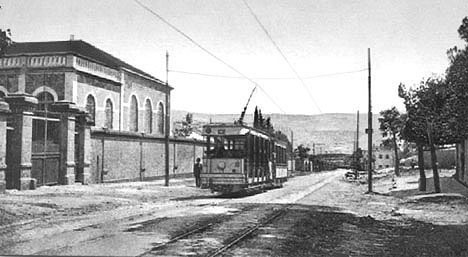 A 1936 economic report indicates that the tram company in Beirut bought the concession and planned electrification.